U.S. Secretary of State William H. Seward purchased Alaska in 1867 from Imperial Russia. Alaska became part of the United State territory in 1912 and has a rich historical background. Alaska uses the motto North to the Future to represent their state. This phrase is indicative of Anchorage where the future is bright and the possibilities are endless. It has the largest population in the state of Alaska where shopping and night life are prominent. Anchorage is a hub of activities where people gather for work and play. The wildlife is abundant and there are many diverse interests for anyone who is looking for adventure. The Downtown Anchorage, Alaska real estate market allows new residents to find the home of their dreams while enjoying the outdoor experiences that Alaska has to offer. The Real Estate Market in Anchorage, AK is busy with a variety of housing options for both buyers and renters. The housing market is heating up with home prices on the rise. Those looking to purchase a home are pleased with the number of houses to choose from as well as the low interest rates in downtown Anchorage. 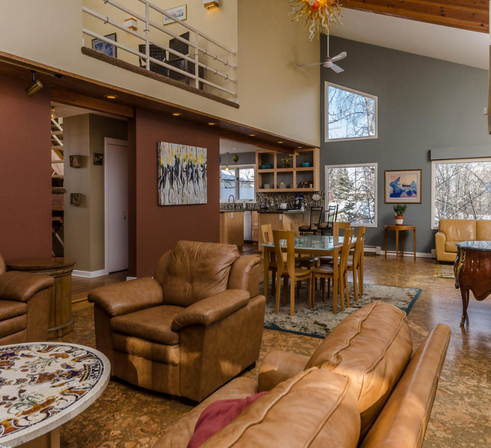 Properties with a view are highly sought after because of the scenic views that Anchorage, Alaska is known for. There are single-family homes, condominiums, townhouses, and duplexes that are available for immediate occupancy in Downtown Anchorage. Where to buy a home is often affected by schools that are in the area. Downtown Anchorage has nearby public and private schools from preschools to high schools with an excellent curriculum. There are also several universities that are conveniently located throughout for higher learning. The city has many attractions that draw people to the area such as shopping and outdoor activities. Downtown Anchorage, AK has something for everyone including museums such as the Anchorage Museum that feature Alaska Native artifacts. The area is full of trendy restaurants, many of which serve local seafood and produce. The modern feel of the city is mixed with its historical past providing residents and visitors with a complete experience. Delaney Park is a city park that has an interesting history and today is a 13-block area where people gather to fly kites and play recreational sports. The shops feature artwork and gifts created by Alaskan artisans. The latest fashions can be found in stores who cater to both men and women who are looking to make a statement both indoors and out. Anchorage has many outdoor activities to choose from because its natural beauty draws people from all over the world to its hiking trails, rivers, and state parks. Downtown Anchorage has quick access to many state parks such as the half-million acre Chugach State Park. It is the third largest state park in the country and is a retreat for outdoor enthusiast. Wildlife of all kinds can be seen In Chugach State Park as well as in and around downtown Anchorage. Bird watchers delight in watching a variety of species that can be seen at close proximity. There are many animals to see such as moose, Dall Sheep, bears, Beluga Whales, and caribou. The Anchorage parklands are filled with wildlife that can be seen year-round. The beauty of the Alaskan frontier is combined with the modern world in Anchorage making it a wonderful place to live.